Robare Custom Homes, Inc. is sensitive to privacy issues on the Internet. We believe it is important that you know how we treat the information we receive about you on the Internet. In general, you can visit our website without telling us who you are or revealing any information about yourself. Our web servers may collect anonymous, aggregate information such as when you visited our sites, how long you stayed, where you went while you were here and if you linked here from another site. Robare Custom aggregates such information to measure the use of our sites and to improve its content. The Robare Custom Homes website provides an opportunity for users to provide personal information about themselves to help us provide our users with better service. For example, we collect information about you when you send us a request for more information about Robare Custom Homes. We collect no personally identifying information about you except when you specifically and knowingly provide it. We will never sell your information to any other company. Robare Custom Homes will use the information that you supply about yourself only to provide you with specific requested information. Robare Custom Homes does not knowingly collect information about children. Robare Custom Homes will delete any such information that it discovers or is made aware of. 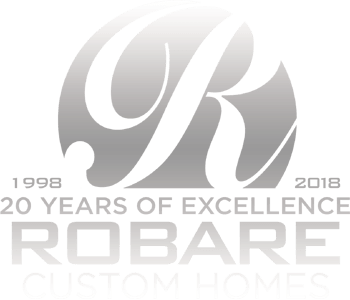 Users should be aware that Robare Custom Homes has no control over any information that users may disclose to other users of the Robare Custom Homes website. 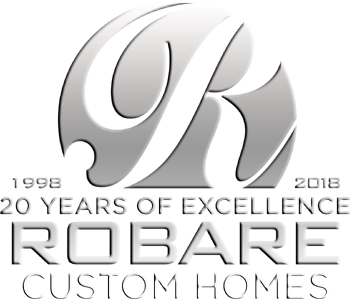 Please notify Robare Custom Homes immediately if you discover that any user of the Robare Custom Homes website is improperly collecting or using personally identifying information of users of the Robare Custom Homes website. We know that online security is a serious matter. At Robare Custom Homes, we consider your online security an important factor of our commitment to overall customer satisfaction. For additional information on your privacy rights concerning data collected by websites, refer to the Federal Trade Commission’s How to Protect Your Privacy pamphlet.